This article is about the church in India in communion with the Assyrian Church of the East. For the Eastern Catholic church in Iraq in communion with the Holy See, see Chaldean Catholic Church. St. Thomas Christians trace their origin to Thomas the Apostle, who is believed to have evangelized in India in the 1st century. By the 3rd century India's Christian community was part of the Church of the East, led by the Patriarch of the East in Seleucia-Ctesiphon, Persia. In the 7th century India was designated as its own ecclesiastical province, and functioned as such until the Portuguese entrance into the region in the 1500s. In 1599, the Portuguese arrived in India and used intimidation to force the St. Thomas Christian community into becoming an Eastern Catholic Church under the jurisdiction of the Archbishopric of Goa, and as a result their Church was Latinized, their Holy books were burned, and their connection to the Church of the East in Mesopotamia was severed in what is known as the Synod of Diamper. The Portuguese set up their headquarters in Goa early in the 16th century and extended their domain to Kerala. The Archbishopric of Goa, backed by the Portuguese, claimed jurisdiction over the Syriac Christians of Malabar. The East Syriac liturgy and the Mesopotamian connection of the St. Thomas Christians lead open them to a suspicion of Nestorianism ; And Archbishop Menezes of Goa, who arrived in Kerala in December 1598 was determined to bring them into the Romanized way of worship. However, The coercive actions of the Portuguese padroado system ultimately caused a faction in the community to follow Archdeacon Mar Thoma I in a rebellion against the Portuguese in 1653 which they called the Coonan Cross Oath, in which they stated they would refuse to obey the Jesuites. The faction that followed Thomas were known as the Malankara Church, however, as a response to this Rome sent a different group known as Carmelites in two groups from the "Congregation for the Evangelization of Peoples" to Malabar headed by Friar Sebastiani and Friar Hyacinth. The Friars first arrived in 1655, and began to deal directly with the Archdeacon, Mar Thoma I. Although he was unable to sway the Archdeacon, Fr. Sebastiani gained the support of many, including Parambil Mar Chandy, Alexandar Kadavil and the Vicar of Muttam, the three councilors of Mar Thoma I. As a result of this, Between 1661 and 1662, out of the 116 churches, the Catholic Carmelites reclaimed eighty-four churches, leaving Mar Thoma I with thirty-two churches. 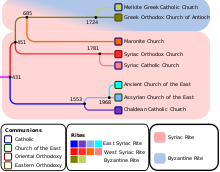 The eighty-four churches and their congregations were the body from which the Syro Malabar Catholic Church has descended, while The other thirty-two churches and their congregations represented the nucleus of the Malankara Syrian Church, which was eventually turned into a West Syriac Rite church in around AD 1665 when Mar Gregorios, a Bishop sent by the Syriac Orthodox Patriarch of Antioch, arrived in India. The dissident group under the leadership of the Archdeacon welcomed him, mistaking him for an East Syriac Rite Bishop sent by the Church of the East. Though most of the St. Thomas Christians gradually relented in their strong opposition to the Western control, the arrival of the Bishop Mar Gregorios of the Syriac Orthodox Church in 1665 marked the beginning of a formal schism among the St. Thomas Christians. 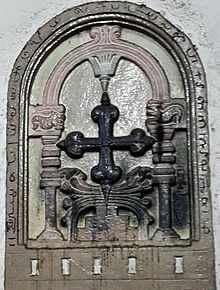 Those who accepted the West Syriac theological and liturgical tradition of the Syriac Orthodox Church of Antioch of Mar Gregorios became known as Jacobites, while The Syriac Catholics remained in communion with Rome and later in the 19th century came to be known as the Syro-Malabar Catholic Church. The Chaldean Syrian Church originates from the faction which stayed with the Catholic Church. The Chaldean Syrian Church's current Metropolitan, Mar Aprem Mooken, has argued that the church represents a direct continuation of the Ancient Church of the East hierarchy in India. However, Mathias Mundadan sets the church's origin within the 19th century autonomy movement within the Syro-Malabar Catholic Church. For over two hundred years the Syro-Malabar Catholics were under the authority of the Portuguese Archbishop of Goa. This arrangement led to resentment from some members, who wanted more autonomy for their local church, resulting in a formidable and sustaining autonomy movement. In the 19th century this movement's leaders made repeated pleas to both the Pope and the Patriarch of the Chaldean Catholic Church (an Eastern Catholic church in communion with the Pope) for their own bishop and liturgy. In response these pleas, the Chaldean Patriarch Joseph Audo sent a request to Pope Pius IX for the Syro-Malabar Catholics to be placed under his authority. Without waiting for a reply, he dispatched Mar Elias Mellus, Bishop of 'Aqra, to India in July1874. Mar Mellus had substantial success convincing Syro-Malabar Catholics in Thrissur District (from Chalakudy to Palayur (Chavakkad)) and some churches in Kottayam District to recognize him as their bishop. 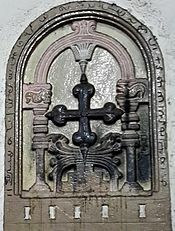 Although the churches and God's People were called by the name Syro-Malabar (also known as Chaldean Syrians at that time) churches and nation, the actual situation is that from Irinjalakuda to northwards and south of Bharathapuzha River and some churches in Meenachil taluk, the Syro-Malabarians( also known as Chaldean Syrians at that time) were half Catholic-half Nestorian with East Syriac liturgy. Nevertheless, By 1877 24,000 followers had joined his group, based in Our Lady of Dolours Church (now Marth Mariam Cathedral) in the parish of Thrissur . In response the Pope dispatched Latin Catholic leaders to remove Mar Mellus from the country, and sent him back to Mesopotamia in 1882. By then, however, he had established the infrastructure for an independent church, which was named the Chaldean Syrian Church. As per the Census Travancore 1901 there was around 24000 Chaldeans.The majority of Mellus' followers returned to the Syro-Malabar Catholic Church, and the ancient Palayur church was returned to the Catholic Church after the Death of the Chaldean Syrian head Mar Mikhail Augusthinos in 1911. However, About 8,000 followers maintained their demand for autonomy, and took their requests for an independent bishop to non-Catholic churches. In 1904 they made one such request to the Archbishop of Canterbury to get an East Syriac Bishop sent, but were declined. They subsequently made an equivalent request to Shimun XIX Benyamin, Patriarch of the Assyrian Church of the East in Qochanis who consented, dispatching Bishop Abimelek to serve as their metropolitan bishop. Mar Abimalek Thomotheus soon revived East Syriac practices and reintroduced Nestorianism to the Thrissur church. These reforms caused even more followers to break away and rejoin the Catholic Church, but through the reforms the original Assyrian-oriented Church of India was revived as it was prior to the Synod of Diamper in 1599. In 1964, during the reign of Assyrian Patriarch Shimun XXI Eshai, a dispute over hereditary succession and church calendars caused the Metropolitan of the Church of the East in India to break away from the Assyrian Church of the East joining itself with the Ancient Church of the East. However, in 1995, Eshai's successor, Mar Dinkha IV was able to heal the rift, and the Chaldean Syrian Church returned to his jurisdiction. The Chaldean Syrian Church in India now constitutes one of the four Archbishoprics of the Assyrian Church of the East. Its followers number around 15,000. The present Metropolitan, Mar Aprem Mooken (ordained in 1968), is headquartered in Thrissur City and is a noted author. His seat is the Marth Mariam Valiyapalli 10°31′6″N 76°13′2″E﻿ / ﻿10.51833°N 76.21722°E﻿ / 10.51833; 76.21722. The Chaldean Syrian Higher Secondary School is also affiliated with the church. ^ "Holy Apostolic Catholic Assyrian Church of the East — World Council of Churches". Oikoumene.org. Retrieved 20 March 2019. ^ "Church of the East in India". Nestorian.org. Retrieved 20 March 2019. ^ Mar Aprem, The Assyrian Church of the East in the Twentieth Century (Kottayam: SEERI, 2003), pp. 49-51, 65 & 70. Vadakkekara, Benedict (2007). Origin of Christianity in India: A Historiographical Critique. Delhi: Media House. Mar Aprem Mooken, The Chaldean Syrian Church in India, (Trichur: Mar Narsai Press, 1977). Mar Aprem Mooken, Church of the East, (St. Thomas Christian Encyclopaedia, Trichur: 1973). This page was last edited on 22 April 2019, at 13:53 (UTC).